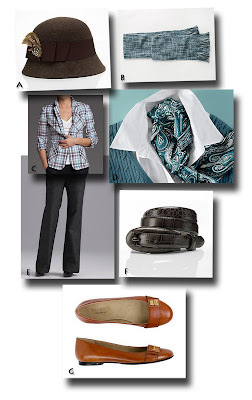 Just About Anything: A Day of Shopping at Talbots! The cold days are here again. And I need some new items to add to my basic long shirts to look chic and well, "updated". I have gone one size bigger too so I really need to buy some jackets and pants. And with the $500 giftcard forTalbots, I could shop till I drop without even spending a penny! Shopping has never been easier too because I can practically find everything in their online shop! Here are my picks for that new look I was booting for, simple but chic and comfy too! I really love the wool felt fedora hat. It looks very old school. But I don't know if I will be able to pull wearing this one. I need a new knit muffler too, what with the winter season just around the corner. I just love the mineral color, it will compliment the soft, V-Neck Sweatshirt and will be perfect for those chilly days. Then there's the Ombre Plaid Jacket that they have on-sale which is perfect with a pair of Herringbone denim trousers. And I just got to have the croc-embossed leather belt. My old one won't fit anymore! Hahaha! And who wouldn't fall in love with this pair of Buckle trim flats? These are just my kind of shoes, flat and comfortable with its soft sole. As I was checking out my items, I am astonished to find that I did not go overbudget! Wow! This is just what I love with the new Talbots, they have made everything more affordable. How cool is that? Now that I am done with my shopping, I can relax and check out the red chair confessions, Talbots' fun and exciting blog. I love their features on Covet This and Spotted categories, and of course, the Daily Confession.